Heeft u een vraag voor Mai Chau Valley View Hotel? Gelegen in Mai Chau is Mai Chau Valley View Hotel de perfecte keuze voor reizigers die Mai Chau (Hoa Binh) en omgeving willen bekijken. Het hotel ligt slechts 0.5 km van het stadscentrum: lokale bezienswaardigheden zijn dus snel te bereiken. Dankzij de praktische locatie liggen alle belangrijke trekpleisters in de buurt van het hotel. De faciliteiten en diensten, geboden door het Mai Chau Valley View Hotel, garanderen een plezierig verblijf voor gasten. Het hotel biedt gratis wi-fi in alle kamers, 24-uur receptie, wi-fi in openbare ruimtes, parkeerservice, parkeerplaats om gasten een maximaal comfort te garanderen. Gasten kunnen kiezen uit 8 kamers, stuk voor stuk plezierig en comfortabel ingericht. Daarnaast garanderen de talrijke recreatieve mogelijkheden dat u zich tijdens uw verblijf kunt vermaken in het hotel. Als u zoekt naar comfort en gemak in Mai Chau (Hoa Binh), dan is het Mai Chau Valley View Hotel uw thuis ver weg van huis. Van 7:45 tot 8:30 uur, zal Mai Chau Valley View Hotel shuttlebus u ophalen bij uw hotel in de oude wijk van Hanoi (toeslagen van toepassing). Indien u gebruik zou willen maken van deze service, vermeldt u dan het hoteladres in het "Speciaal Verzoek" vak voor ophaalservice. Mai Chau is prachtig gelegen. De kamers hebben heel mooi uitzicht over de vallei. De eigenaar was ontzettend vriendelijk en nam ons de eerste dag mee voor een fietstocht door de omgeving. We hoefden daar niets voor te betalen. Thee gedronken bij een heel oud vrouwtje in het dorpje waar ook de eigenaar vandaan kwam. Zo bijzonder en gastvrij. Wij zijn hier 3 nachten geweest, de omgeving is prachtig en goed te verkennen, per fiets of te voet, vanuit Valley View Hotel. Goede kamer en zeer adequate service. Helaas was het erg heet (hittegolf); het najaar is een betere tijd voor deze plek. Prima hotel als vertrekpunt voor prachtige wandel-, fiets- en brommertochten. Hier kun je in een omgeving met voldoende faciliteiten het niet toeristische platteland van Vietnam leren kennen. De eigenaar kent de omgeving goed en helpt je de mooie paden en leuke weggetjes te vinden. Als je een beetje avontuurlijk bent ingesteld, is het werkelijk genieten. Simple room with adequate heating (I visited during the more chilly parts of the year). What made this stay great were the people. The owner gave us hand-drawn maps with detailed instructions on what to look out for and where to walk on our 1.5hour long trek as he was afraid that we would wander off and get lost. His instructions were clear and easy to follow, and we had a great time walking through the beautiful nature reserve. Bicycles are also free here, so you might opt to take a cycle through the paddy fields and some nearby villages. Would recommend to anyone looking to get away from the hustle and bustle of the city life! 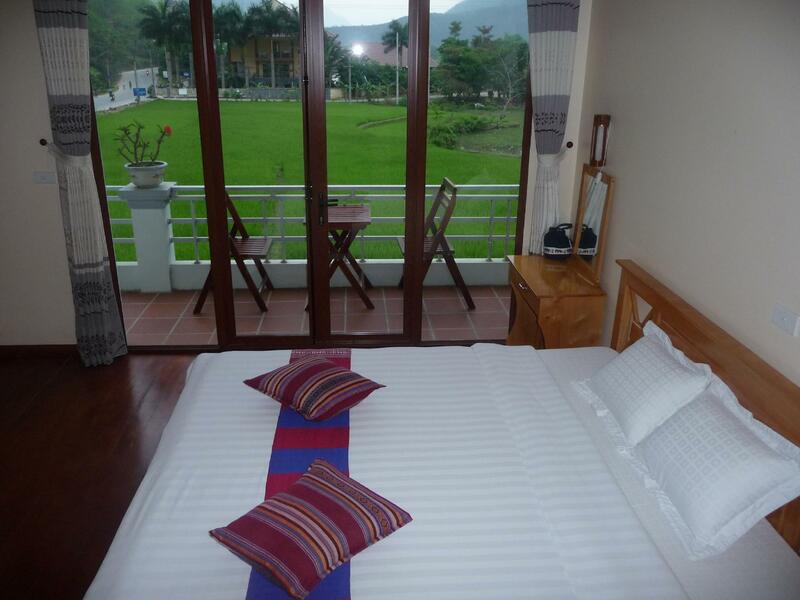 Lovely, clean rooms, with wonderful views of mountains and rice paddies. Good food and friendly staff with decent English skills. Our guidebook had said there was no reason to stay in the town itself, that it was better to stay in one of the little villages, but we strongly disagreed. The hotel's location is perfect, at the edge of town, so easy access to food options and a 5min bike ride from the little villages, which turned out to be too touristy for us anyway. Only negative was the water pressure in the shower, which was almost non existent. Great views of rice paddies from balcony. Right on Main Street in town. Had free bikes and they provided a map of self bike tour but we still had to use google maps to direct us. It was really nice to discover the area by biking. Views were spectacular. We passed through different villages and their shops but we didn’t stop since they sold same same of everything. Stayed one night and was adequate. Main activity was biking. Didn’t visit the cave. A great location with fantastic views. The room (and bathroom) was a good size and spotlessly clean and comfortable, the king size bed was a huge king size. The food at the hotel was to a high standard and reasonably priced. Mr Duong (the owner) is very knowledgeable on the area and offered us a free bicycle tour of the surrounding area. Free use of bicycles is a bonus. Mr Duong was very helpful in organising our onwards travel and arranging transport to the road junction to meet the bus. It is a small family run hotel with staff that are sincere and helpful. On our last day we could stay on in the room until 14.30 without charge awaiting our pick up bus for 15.00. Nice place, the staff very frendly, big room and bed, it was clean. This hotel "saved" me from a freezing cold homestay which had no sort of heating. I'm ok in hot weather but I don't do well when it's very cold. The homestay could only provide more blankets, not even a space heater, so I decided to leave and find a hotel with climate control. Luckily I found Mai Chau Valley View last minute, and it was perfect. The owner is very nice. The rooms are clean, the view is also very good. It's so close to Lac Village too, that still felt like I was there. There was heating in the rooms and hot showers. And the breakfast was very good. I would definitely recommend staying here. They provide free bicycles to guests as well. The service provided here is excellent! Being in 5-stars hotels before, I have never had such services with so much sincerity. The hotel is just 20 meters from the bus stop, very convenient! Free bikes is a plus. Motors are for rent at reasonable price. However, little problem with 2 motors that we rented: the first one had a flute of gasoline that we got out of gasoline just after 10 km, had to come back in emergency to the hotel. The second was ok but the brake worked not very well (still ok, but we could not use for some slope due to safety reason). Anyway, it was a great pleasure staying there. Thank you for your services! We were trying to get a bus from Ninh Binh to Mai Chau and couldn’t find one because it was really last minute but the boss of the hotel helped us through and even personally picked us up in the middle of the crossroad where our bus alighted us and took us for a bicycle tour while explaining to us his village’s culture and history. The hotel was really clean and the views was 10/10! Highly recommend this place! The hotel localization is awesome, the room view is wonderful. Food served there is good but a bit expansive. The breakfast is really good. The owner of the hotel is really nice and spent two hours biking with us in the valley telling us about the local lifestyle. Well, I can't say enough good things about this place. Mr. Duong, the owner, was so kind and helpful. He took us on a village tour via bicycle- was the most memorable experience during our northern Vietnam trip! What a fantastic experience in Mai Chau- much due to Mr. Duong and his sweet and kind staff! The rooms were nice and comfortable- the bed was awesome! Big and the perfect feel for us. Only 4 TV channels, but that's okay... You're in a retreat area anyhow! The food was wonderful- the best breakfast during our entire trip! The lunch was also fantastic- the papaya salad was so delicious, as we the other dishes we ordered. Highly recommend eating at the hotel, as the other local food we tried was not nearly as tasty. 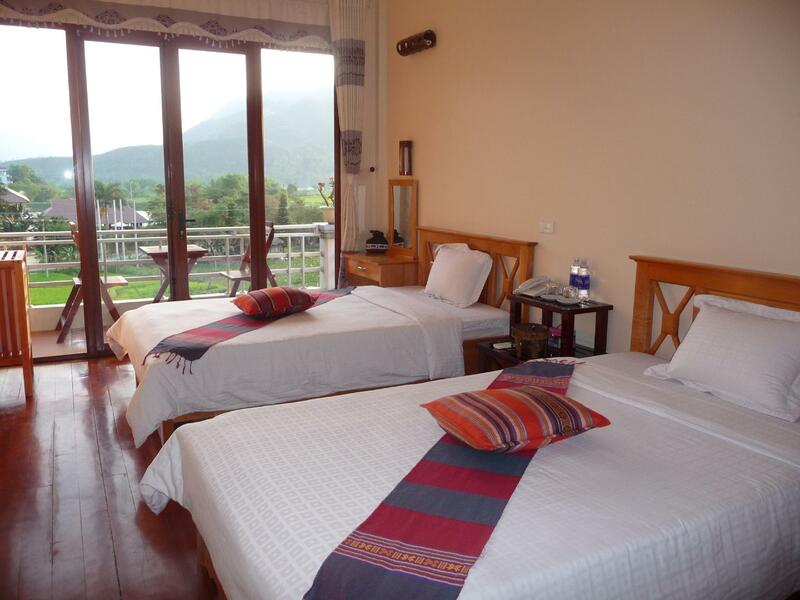 If you're planning a trip to Mai Chau then Mai Chau Valley View is THE place to stay!!! We really enjoyed our stay at Mai Chau Valley View Hotel. The staff is really friendly and offer great services, like a free bike ride through the rice fields and villages. The food is amazing and you can walk/cycle to the cave, shops and the rice fields. The staff, food and rooms. We came back after a years absence to this enchanted valley with it's wonderful people and stunning scenery to stay again at this brilliant little hotel. Immediately we felt as if the owner has made a real effort with his hotel not only to keep the good clean standard he had already set but to give it just a little upgrade and he had managed. Little details like adding safety deposit boxes , adding toileteries to the bathrooms, fresh fruit in the rooms every day etc. You really feel he cares about his guests He greeted us every morning to check what we wanted to do. He gives his guests directions and advice of where to hike, cycling routes to suit their requirements; and was everything OK. And yes it was at breakfast time - an updated menu with everything you could want ( especially liked the thick sliced wholemeal brown bread!!!) We spent a couple of very happy and relaxing days here and will certainly return. Mai Chau is primarily a package tour destination, and most of the package tourists stay at the stilt house homestays in the villages. Those homestays are often very nice and a spectacular value for the money, but what if you've made your own way to Mai Chau and prefer a little more privacy than a homestay typically provides? Mai Chau has precious few options. Fortunately, one of those options is absolutely top notch. Meet the Mai Chau Valley View Hotel: almost as nice as the Mai Chau Lodge but many times cheaper. The rooms are extremely comfortable, generously sized, and have outstanding balcony views of the rice paddies and mountains. The internet is really exceptionally fast for hotel wifi - faster, actually, that I wanted or needed on my "escape from the office" unplugged retreat. It was so fast, in fact, that I streamed a movie in my room without it stopping to buffer once. The hotel serves delicious breakfast with many options. I had beef pho with a big serving of fruit one morning. I ordered banana pancakes with a side of bacon and another heaping plate of fruit the next. The dinner I ordered ala carte my second evening was also pretty yummy and just as good as the overpriced meal I treated myself to the previous night at the Lodge. And the staff are incredibly lovely. Mr. Dung, the owner, made me feel very welcome and enquired numerous times to make sure I was enjoying my stay. The girls behind the desk were friendly and cheerful, and they seemed genuinely delighted that I speak a few words of Vietnamese. Honestly, I can't recommend this place highly enough. Don't waste your money at the more expensive options at home. The Mai Chau Valley View works harder for your hard-earned cash and deserves it more. Brilliant Mr.duong will make sure you come away from this beautiful valley with the most friendly of peoples wishing you could have stayed longer.Everything about this place is special, the food, the views , the wonderful service from Na and Yen who will make sure you never leave the table feeling half fed! This is just one of those places which you can't forget and will want to come back to. A lovely experience! The owner Mr Duong was very hospitable, brought us around himself to visit nearby villages. He is a great source of local information. Surprisingly after trying out several restaurants in Mai Chau, we found the hotel's food the best in town. Would definitely stay there again and highly recommended for anyone going to Mai Chau.